Sometimes it's nice to make friends with the strangers you meet on your travels. Not when a failed English clown is ruining your once-in-a-lifetime trip to Lisbon. A reader story. LISBON – One of the greatest benefits of solo travel is that it forces the lone backpacker to open up to a world of people and experiences she would have never otherwise encountered. But there are people worth opening up to, and then there are people to be run, sprinted, catapulted as far away from as technology will allow. This story is about the latter. It all happened in Lisbon during a year of solo working and traveling abroad between college and graduate school. Upon setting my heavy bags down in a clean, airy hostel nestled in a quiet residential neighborhood, I quickly made my hostel friend, a masseuse named Heleni, and we headed out to explore the city. I hadn't known what to expect of Lisbon, but was quickly overwhelmed with the city's beauty. Heleni was the perfect travel companion, happy to wander up cobblestone streets just to see the view that awaited around the corner and to snack on cheese on a bench and talk about what our lives had been so far and what we hoped they would become. Heleni was the best kind of travel friend — one of those instant and passionate connections you can only really have with people who are also searching for something in a big way — and who you'll never have to see again in one to three days. But even this friend-romance could do little to prevent the social misery I was soon to encounter as I waited alone for dinner in the common room while Heleni was in her room getting dressed. For ten wonderful minutes, I scribbled my observations from the day into a tattered notebook, reflecting on all that I had seen and the ways in which I was changing. In shuffled a disheveled lump of a man, radiating anger and depression from every pore. I avoided eye , fixing my eyes solidly on my notebook. Naturally, he plopped down right next to me on the couch with a dramatic sigh. "'Ello," he said, his cockney accent thick with a lifetime of abject sadness. "I hate this place." Without waiting for any further invitation, he launched into a story about how he hated Americans because he had wanted to holiday in the "land of the free," but the customs officials turned him away because he had a criminal record. Now all that was left for him was a holiday in Lisbon, which was a dirty, fourth-rate city, too dreary like England, which didn't do him much good because he was chronically depressed and it seemed the whole world was against him and by the way, his name was Tom. 'Ello. I'm a depressed criminal who hates your country and I'll be sleeping in the room next to you tonight. And how are you? Now, it's not that I didn't empathize. I have no idea what his crime was or how he felt about it. But I have a history of letting my empathy for other people turn straight into guilt, which then turns into me wasting an entire experience supporting a stranger who needs professional help and not getting to enjoy my own life. And I would be damned if I was going to let Eeyore ruin my once-in-a-lifetime visit to this romantic city. For a full night I tried in vain to hand him off to other people, making introductions and scurrying into neighboring rooms. But so did everyone else, and he was passed from one social circle to the next until I felt bad for him and found myself caught again in conversation. Perhaps that's why I felt entirely justified (and still guilty) the next day as a group of us tried to sneak out the back stairway for a day trip to the nearby town of Sintra — a clandestine operation, as our depressed friend had asked every one of us what we were doing the night before. We told him five conflicting lies and then, begrudgingly, the truth, to which he responded that he didn't want to go there, he wanted to go to a Lisbon suburb. But no, he wasn't going to go alone, and before I knew it, he was shuffling along behind us, grumbling about the rain and how nothing ever went his way. On the train to Sintra, the seats again became his barstool, we his unwilling bartenders. This time, we were treated to a tragic tale about his lack of career luck as a performance artist. "No, a performance artist." But this wasn't due to any particular passion for performance art. He'd just heard somewhere that it could be good therapy. Sagely, the program directly had responded that they couldn't enroll him for therapeutic purposes — they'd have to refer him to a counselor for that — but they could if he wanted to become a performance artist. And so, it seemed our languishing companion had been rejected from clown school. I tried to enjoy the rest of the trip, exploring lavish houses and gardens that I hoped would transport me to a more fanciful world. But around every corner, there was our poor failed clown, just in time for group photos, which proved another opportunity for him to stare mournfully into the distance as the rest of us smiled into the camera. 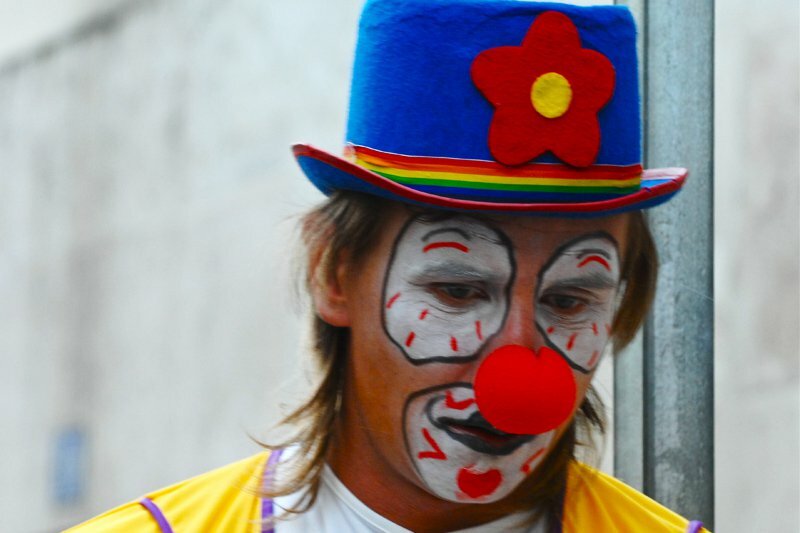 Eventually, our dear Depressed Clown moved on, and so did I and all of my hostel friends. We tried our best to enjoy Lisbon as much as we could, walking the fine line between making the most of our own experiences and not being outright cruel to a person so clearly in pain. I've never quite figured out how to act in this situation, but that's my own issue to be worked out in performance art school therapy.